Dead Space 2 is available now on Steam for just $5.00/£2.49—but be quick; it won't stay that price for long. Dead Space 2 sees you reprise your role as Systems Engineer Isaac Clarke three years after the horrific events on the USG Ishimura. Expect more of same atmospheric horror and monster-stomping action, only this time around, Clarke's a little less taciturn when he encounters more of those murderous Necromorphs. If you've never explored the original game, you can add that to your library for cheap, too. 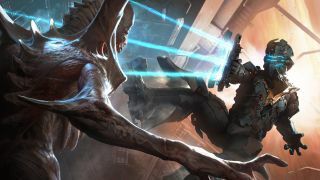 The Dead Space bundle—which boasts the tense prequel, too—is available for just £3.74, a whopping 81 percent off its usual retail price. Last month EA closed Visceral Games, the studio behind Dead Space and Battlefield Hardline. Electronic Arts' vice president Patrick Soderlund confirmed the closure and confirmed that the design direction of Visceral's Star Wars project will undergo a "significant change." In the words of one plucky commenter on the Dead Space 2 customer reviews page, "Don't be sad that it's over, be happy that it happened."